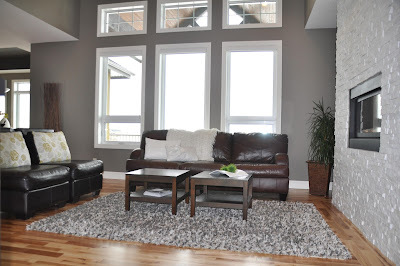 Just popping in today to show you a few updates I made to our living area a while back. It's still far from my vision for this space but each new addition gets me a little closer. Back in the summer I moved the rug to our master bedroom and lived without one for a while. It took me a while to figure out why the kids started playing on the front entry rug (the only rug in our main area). My beef with this rug in the living room was all the lego pieces getting lost in the long shag and wool fibers until one pierced your foot or you heard them journeying through the long dark chambers of the vacuum hose. My wish list for a rug for this space was low pile, durable and 8 x 10 or larger. 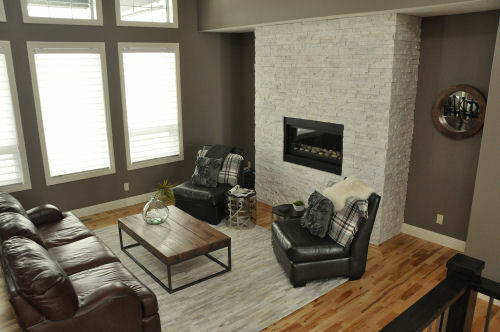 Enter Homesense with the 8 x 10 cow hide rug. Of course the furniture arrangement gets changed just about every time I vacuum. And the former floral chair backs have just been covered by an inexpensive Ikea throw. When my husband goes away I like to play and that usually means building something. 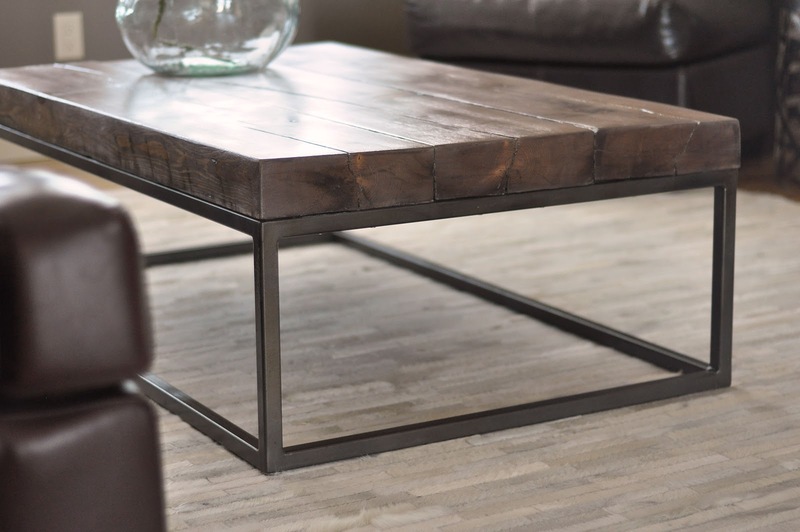 I had been dreaming of a similar coffee table for a while from restoration hardware so when I stumbled across some more unused timber I had just the project for it. I had our local welder put together the base for me and then I brought it home and sprayed it. I had never tried this spraying method before but it worked like a charm. I took two different spray paint colors (rustoleum's hammered nickel and rustoleum's graphite) and sprayed them simultaneously at a 45 degree angle (sorry no photo - both hands busy). Once dry, I just spritzed the metal lightly with rustoleum's bronze. This created a subtle worn look with nice depth. Then of course sanding the timbers, stain and varathane. Rustic, tough, durable. Perfect for our family. Your living room is lovely. i especially like the change you made in switching out the floral cushions on your chairs to the Ikea fabric as it suits the overall theme/feel of the room. I also love your new coffee table. I have done a similar spray paint effect on some hideous brass lamps and now they look like something almost Restoration Hardware worthy. Spray paint is wonderful for transforming things! Your home is beautiful! Thanks so much for sharing your projects and ideas.